This is a high flow filter unit that can be connected before the cold water input on any kitchen tap to make it a filtered water tap! Easy to install yourself, you can now ensure peace of mind when using your kitchen tap. With this Puretec Puremix X6 Filtration unit your town water will be turned into pure drinking water. Even with Australia's high quality standards for drinking water, there can be some miniscule toxins left in your water. With the Puretec Puremix X6 you can be sure your family is consuming some of the best filtered water available. Spare cartridge available here. Standard Connections - The Standard 1/2"BSP (15mm) connection allows for up to 8L Per Minute, therefore not compromising your water pressure. Easy Installation - Using your existing tap connections and the connections supplied, installation is a breeze for any registered plumber. Long Life - This unit is rated at 37,500 Litres, which means it will last longer between replacement cartridges. 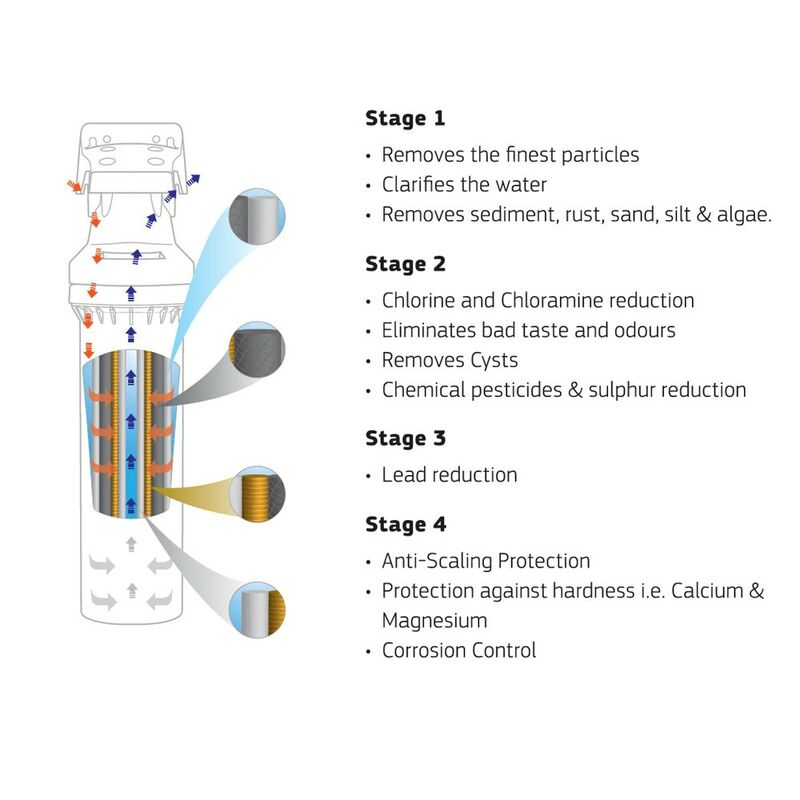 4 Stage Filter in one cartridge - Removes Sediment, Chemicals, Lead, Calcium and more in one cartridge. Compact - This all in one unit is only 450mm x 215mm and can be installed vertically or horizontally to make the best use of your space! Warranty: 10 years (Important Note: Use only genuine Puretec replacement cartridge. Warranty is 10 years parts, 1 year parts and labour, excludes cartridge. Click on the book to download the Specifications Sheet for this product. Installation is a breeze for any registered plumber, as the PureMix X6 installs under your existing kitchen bench and uses your current tap (no need for a second tap). The unit can be installed vertically or horizontally, so it won’t clutter up your cupboard.